At Fabric Paradise, we love fabric. Many moons ago, I took my first "Home Economics" class. I don't remember much about it, except that I inserted the "invisible" zipper in my assigned dress SEVEN times -- and the seventh (last) time, I put it in backwards...Despite that, and because my wonderful mother had the patience to teach me to sew, my passion for sewing, and for beautiful fabric, was born. Twenty years (and many, many BOLTS of fabric) later, I still get a thrill looking at, touching and of course, buying beautiful, fun novelty fabrics! (OK, so I have a little fabric addiction problem!) My husband, my accountant and I have decided it's time to share! ...and thus, Fabric Paradise was created! We've been 'collecting' terrific cotton novelty prints from all over the textile world for over 20 years! We also have a great selection of cotton novelty flannels and the best quality whimsical cotton knits...and more bolts arrive DAILY! You may have noticed that some of our fabric categories are empty or somewhat small; we continue to upload images of all our fabrics as quickly as we can so please 'stay tuned'! You can always contact us via email, phone or by using our free "Live Person" feature (that little floating rectangle at the bottom right of the screen). Simply click on it to 'speak' with us live or leave us an email message if we're away temporarily. We will get right back to you! If you're searching for a discontinued print fabric (and these days it seems as if the manufacturers discontinue fabrics before the ink has dried!) and don't see it on this site, please give us a call toll-free at 1-877-ELKAFAB. We may just have it and we love when that happens! If you're searching for a new print that you don't see here, please contact us and we'll check our new arrivals or order it for you if possible. 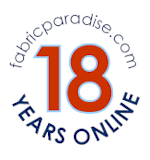 At Fabric Paradise we pride ourselves on locating the fabrics you want and providing the customer service you deserve! We look forward to your Internet visit! Please email us at info@FabricParadise.com or call us toll free at 1-877-ELKAFAB (355-2322) for a speedy response to all your novelty fabric needs. "There's No Such Thing as Too Much Fabric!"